Love is Wherever You Find It – Eat Me. Drink Me. Warm murmur, glasses clinking, candlelight, the smell of herbs and browned butter, a room full of people crammed around a long, improvised table, a whole roasted turkey. 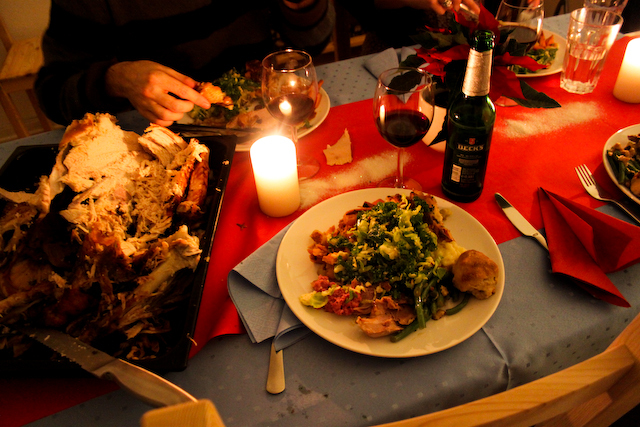 Thanksgiving in Berlin, beautiful. Jamie and I have spent all morning cooking. Turkey with herbs and butter and apple cider gravy, bratwurst, apple and cranberry stuffing, celeriac and potato mash, carrots glazed in sherry, green beans in toasted walnut vinaigrette, cranberry nut rolls, roasted sweet potatoes with sage, kale and Brussels sprouts salad, apple pie, pumpkin pie… All of the good things Thanksgiving means. Elisabeth comes home around one after a long day at school and a quick shopping trip for some last minute menu items, and begins to set up the living room. At three, a quick pick-me-up (vodka/muddled orange, mint, brown sugar/goji berry smoothie), and back to work. We sneak finger-fuls of gravy base at regular intervals, dance around the kitchen to tacky party pop with whisks, improvise baking dishes from cake pans, toast with cans of champagne. Our guests arrive between six and seven, I slip into my party dress, purchased at a vintage store last weekend in Paris, wipe flour from my face. We work through until eight – the last minute touches to a big dinner party – adding the olive oil to a dressing of Dijon, shallots, garlic, and sherry vinegar whose flavors have been melding all day, pouring pan juices into gravy base, shrieking at how good the gravy is, grating parmesan. Everyone is seated at the table. Elisabeth and I make a toast, piles of food behind us. I look around at the table of people – new friends and old – and remember why Thanksgiving is my favorite holiday, no matter where I am or who I’m celebrating it with. It’s about sharing what you have, being together, being thankful, loving, and allowing yourself to be loved. 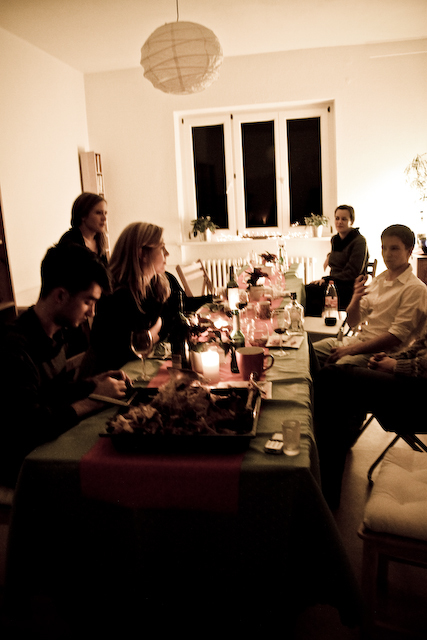 Thanksgiving with you is always a love feast…no matter where you are. You will spread Thanksgiving to the world. love you.